6-CD boxed set (LP-size) with 28-page book, 159 tracks. Playing time approx. 407 mns. 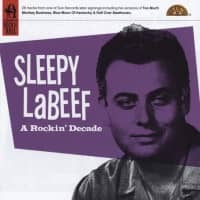 Generally acknowledged as one of the greatest live performers in rock 'n' roll, Sleepy LaBeef has never received his due as a recording artist. It's no understatement to say that he has a more encyclopaedic knowledge of American roots music than any other artist who ever lived. This 6-CD-set is the definitive edition. 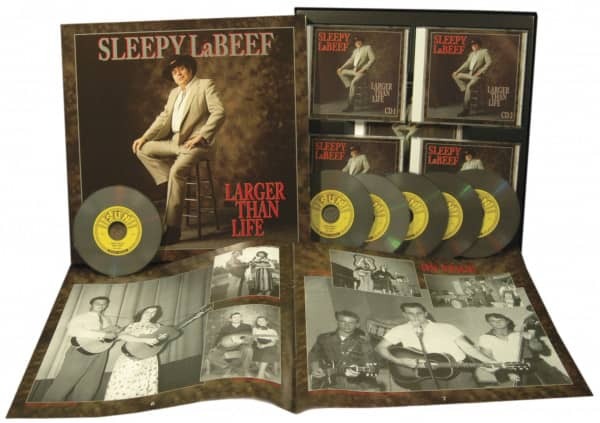 It includes all the early recordings for Starday, Dixie, and other Gulf-coast labels, rare and previously unissued demos, all the Columbia recordings from 1965-1967, and all of Sleepy's Sun recordings from 1970 to 1979, including his gospel and western LPs. 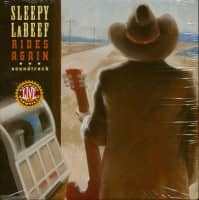 Longtime Sleepy faves like Ride On Josephine, Boom Boom Boom, Ragged But Right, Thunder Road, and There Ain't Much After Taxes are all here. 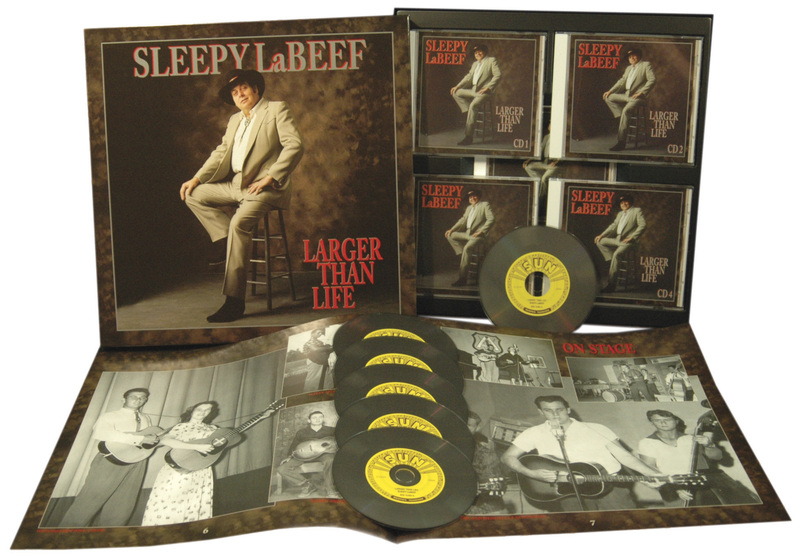 "Mr. LaBeef is a living, breathing guitar-picking history of American music." 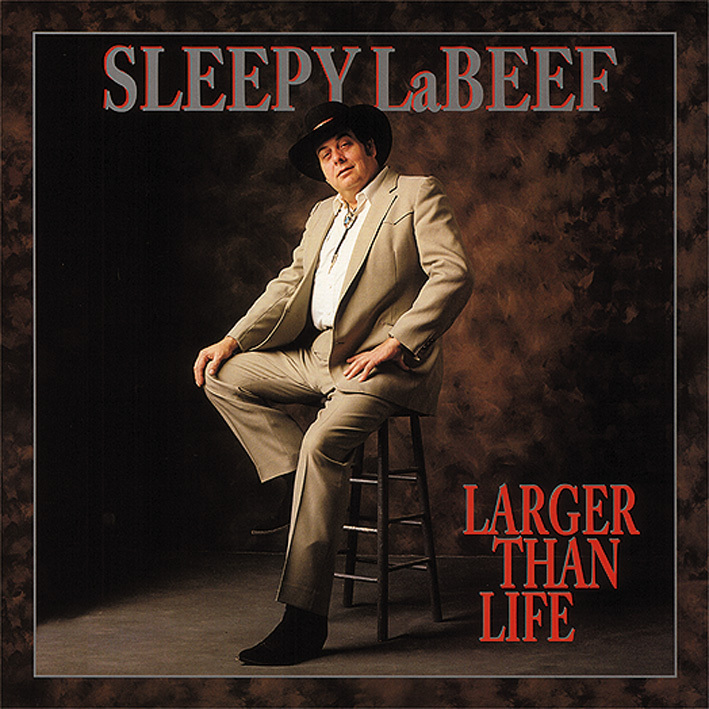 When Sleepy LaBeef made his first record, All Alone, in Texas in 1956, he probably didn't think that over fifty years later he'd be reprising the song as part of his umpteenth visit to Europe to dispense his heady blend of rocking American roots music to an international audience. 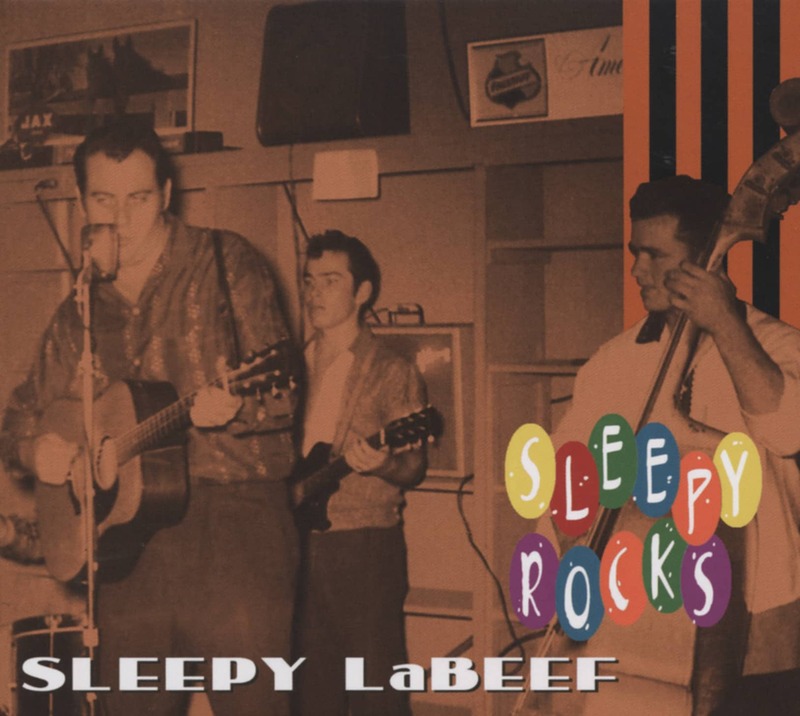 In the twenty-three years of recordings summarised in this CD, Sleepy developed a truly rocking pedigree. From 1956 onwards, he left a trail of music that stretched from small Texan record labels like Starday and Dixie through the major Columbia label to Plantation and the reincarnated Sun Records, of which, by 1979, when he first arrived in Europe with his music, he was the mainstay. 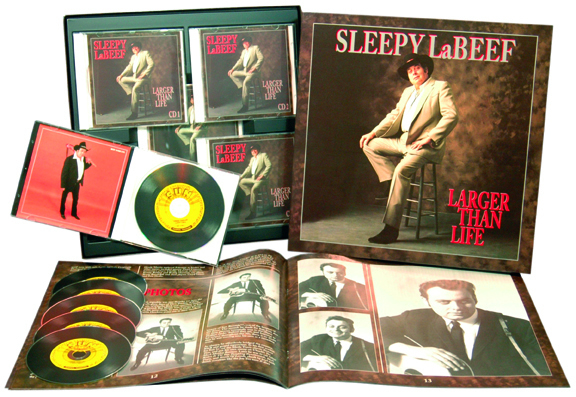 Sleepy's claim to fame has always been as much about his live performances as his records, though. Over the years, he transformed his man-mountain frame, his baritone voice, and his outstanding lead guitar playing into a human jukebox, with a repertoire running to many thousands of rock, country, blues, cajun and other gutsy songs. When he arrived in England in 1979 for the huge annual country music festival at Wembley, he was then, as now, an absolute fanatic about the music he plays and loves. At the end of a long pre-festival dinner, he was acting like a one-man press-gang making me and his European record label bosses stop by his hotel room to listen to a tape of his latest recording session, made in Nashville a couple of weeks before. All evening, while the other artists were skipping the dinner altogether or else putting thoughts of music to the back of their minds, the abstemious Sleepy's conversation was laced with reminiscences and thoughts of rockabilly, of Wayne Raney, of the Delmore Brothers, of Tex-Mex border radio station XERF, and of attending Elvis Presley's early appearances in Texas. He was still going strong at midnight, trying to recall if he played lead or rhythm on the particular cut that was now previewing on his tape machine. 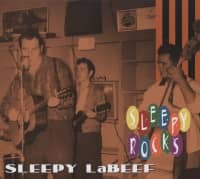 We left eventually, with beefy rockabilly music swimming around in our heads, still hearing guitar solos that sounded like an inspired compound of Scotty Moore and Bo Diddley, and wondering what else there was to come from the human jukebox. 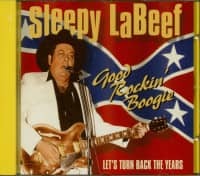 Some thirty years further on, we now know that Sleepy has let the jukebox keep on playing. He's continued to tour prolifically, despite health problems in recent years, and has made an impressive number of albums and CDs that together define the roots of America's music. The LaBeef story began in that unlikely-named dot on the map, Smackover, Arkansas, back in July 1935. The town was originally a French settlement called Sumac Couvert, which at some point was anglicised to Smackover; just as the LaBoeuf family became LaBeff (and only much later, LaBeef). There had been an oil boom in Smackover in 1923 but Thomas Paulsley LaBeff's early life was among the farming community some seven miles outside town. Tommy was the youngest of ten children, and perhaps it was of necessity that he developed a calm and laid-back approach to life. This became emphasised after his first day in school when his classmates started to call him 'Sleepy' on account of his heavily hooded eyes. He left school early after an eighth grade argument with a teacher but, he emphasises, "I never did stop learning." One of the things he was most keen to learn about was music. He was not from a particularly musical family, but told me: "I had two uncles who used to play old fiddle breakdowns. And I really wanted to learn, and I found that if you really want to do something you can learn fast." The music he wanted to learn about first of all came from the United Pentecostal Church. He told promoter Richard Flohill about deacon Vernie McGee: "Church was a big part of growing up. The music was always powerful, and later on – when I got my first guitar – when I was 14, I learned just by watching the deacon play in church every Sunday. Those old gospel songs really got me inspired." He attributes the feeling that is in all Southern music to gospel music, and he feels that people like Sister Rosetta Tharpe provided the basis of the rock 'n' roll beat. Not that he was unaware of secular music. While selling watermelon in town as a kid, he picked up snippets of the blues there: "You'd walk past those jukes and hear the music coming out the doors, and you'd remember it." He was inspired, too, by the music he heard on the radio, recalling, "we didn't have TV back then. So we grew up listening to the radio. But you know, it was so good back then we could visualise it, we could almost see those guys working. I could catch the 'Louisiana Hayride' out of Shreveport and the 'Grand Ole Opry' out of Nashville, and blues programmes out of Chicago, Little Rock, New Orleans. You'd hear hillbilly, you'd hear Hank Williams, you'd hear blues singers, you'd hear Bob Wills band, and Lucky Millinder with Sister Rosetta Tharpe – she was real fine – and you'd hear Red Foley, and bluegrass, and the radio hits of the day. So many of those people are gone now, but they made their mark with me." He told writer Peter Guralnick about his desire to play music himself: "I got my first guitar when I was 14 and was playing rhythm in just a couple of weeks, and soon learned how to play lead parts." He had gained the guitar by trading for his rifle, emphasising his interest in the city life over the country. Leaving school, he worked at various jobs including grocery clerk, truck driver, "and some on the job training in land surveying working for the state of Arkansas Highways Department." 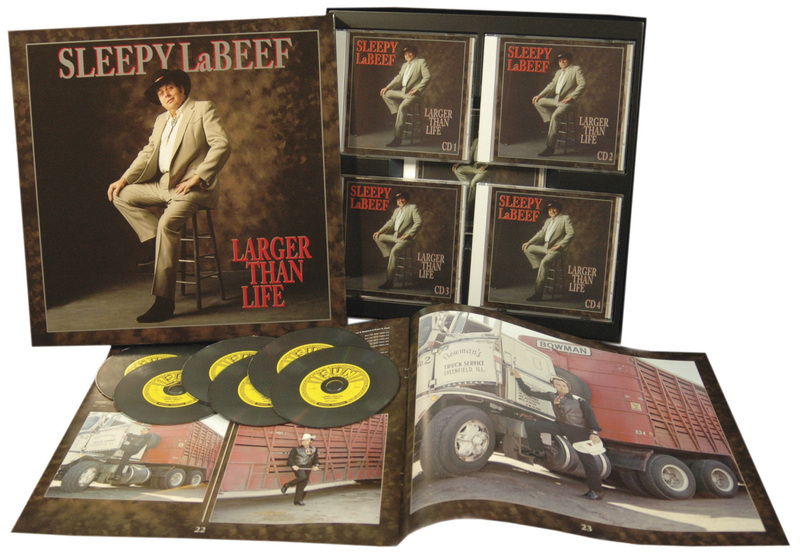 Customer evaluation for "Larger Than Life (6-CD)"